Historians may never know when embroidery first came into being, but it is safe to say that as long as people have been making clothes out of fiber, they have also been embroidering them. The sewing techniques people use to make, tailor, mend, or reinforce clothes also opens a world of possibilities to decorate and embellish them. The first solid records we have of embroidery are as far back as 500 BCE China and 300 CE Sweden. Embroidery most likely emerged from the Levant, where gold thread was used to lavishly decorate the royal robes of the Persian emperors. The art form then made its way into China and then slowly entered Northern India, which today is the nexus for this art. The first place embroidery really took hold in India was Kashmir. As we emerged into the Common Era, specific kinds of embroidery sprouted up all over India. Each one is specific to the region it is from—we get Chikankari from Lucknow, Kantha from Bengal, Phulkari from Punjab, Aari from Kashmir, and Shisha from Rajasthan and Gujarat. With this absolutely colorful history, it is no wonder designers like Aneeth Arora of Péro and Dries Van Noten chose to work closely with Indian communities to preserve the wonderful skills of these regions and instill their clothes with an artistic mastery like none other. 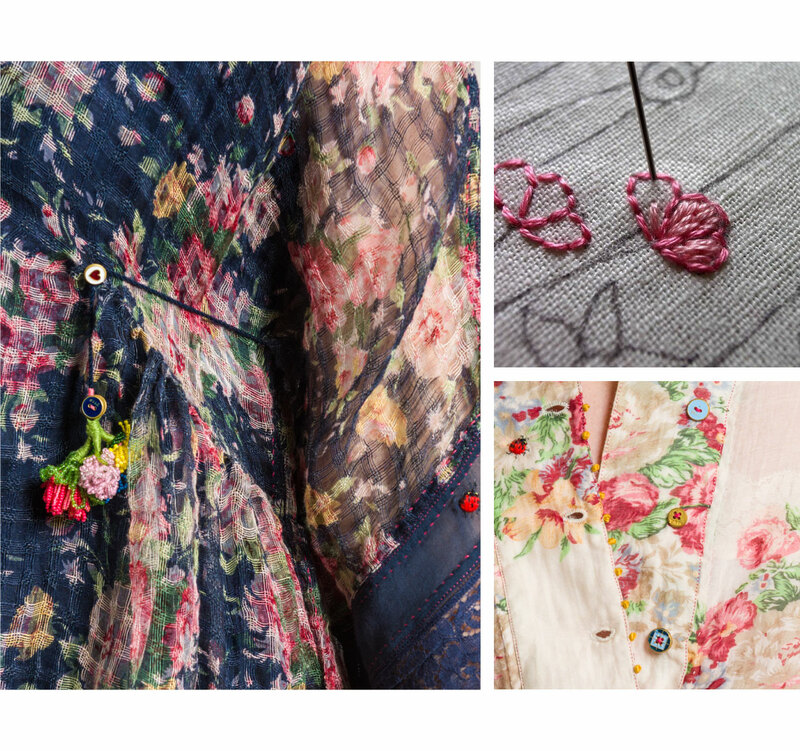 Embroidery is not only beautiful to look at but it gives each item a sense of uniqueness that feels both warm and personal. Embroidery is an art that can be found worldwide. It has been used as a sign of wealth, as a sign of individuality, or even as a sign marking a girl’s path into womanhood. It has been a sacred source of income for farmers in the winter time and one of the few historical sources of income available for women until about the 19th century. It has also been a community event, where women get together to simultaneously embroider, relax and socialize. With each motif created on a piece of cloth, a story is told. As an honored gift to his allies, Zahiruddin Babur, the first founder of the Mughal Empire would give a sumptuous set of clothes to mark the partnership. The gift would include a turban, long coat, gown, fitted jacket, sash, shawl, trousers, shirt, and scarf. Each item would be woven from the goat fur of the region (also known as cashmere) and embroidered with gold-thread. This ancient type of gold embroidery, originally from Persia, is called Zardozi and is a favorite today by Indian Brides and is used for any garment that needs that extra royal touch. In 1568 CE Babur’s grandson, Mughal Emperor Akbar conquered Kashmir. The Mughal emperor Akbar was a huge fan of a beautiful aesthetic. So, along with fostering the production of cashmere (or Kashmir) shawls, he also fostered the art form of embroidery, setting up royal workshops in Lahore, Agra, Fatehpur, and Ahmedabad. Kashmiri embroidery draws its inspiration from nature, mostly featuring birds, flower petals, vines, lotuses and trees. It only uses a simple chain stitch and was first mostly seen as a white thread on a white or off-white cloth; today Kashmiri embroidery can be extraordinarily colorful, but still uses the original chain stitch. Today we call this embroidery from Kashmir either Kashidakari or Aari. Just below Kashmir, on the northern point of India, is the region of Punjab. Punjab is known for their embroidery style called Phulkari. Its name literally means flower-work and usually features complete flower motifs. 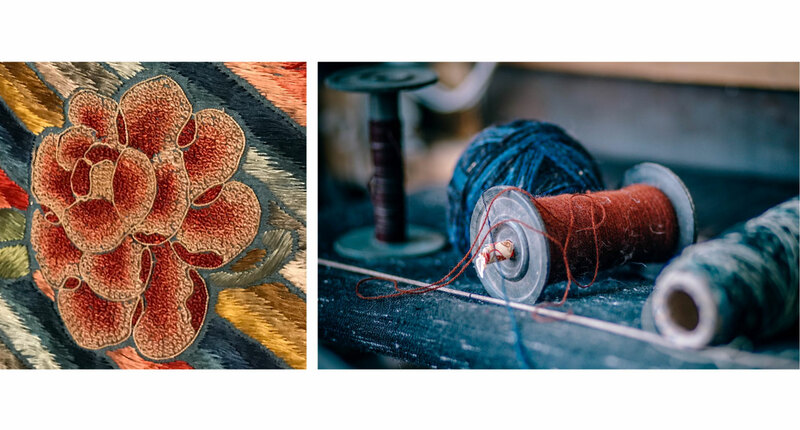 As the common embroidery of “country” folk, it is characterized by elaborate floral motifs entirely covering a modest hand-spun cloth—no space on the cloth is spared. Historically, it was primarily used as a pastime by women of the household, but today it is used by Indian fashion designers as a purposeful design element. Next we go to the northeastern city of Lucknow in Uttar Pradesh, where the common form of embroidery is called Chikankari. It is said that the Mughal Emperor Jahangir (who ruled after Akbar) is responsible for fostering this style of embroidery in this region. It is very similar to Kashmir embroidery, where the motifs are nature based and a white thread is used on white muslin or cotton, but Chikankari uses more complex stitches such as buttonhole stitches, french knots, running stitches and shadow work. The patterns are created by block printing the motif on the fabric, and then stitching over the pattern. Traveling to the Bay of Bengal, we go now to West Bengal where the most common form of embroidery is called Kantha. Closely related to the Japanese form of embroidery called Sashiko, Kantha embroidery involves long running stitches that bond two or more sari fabrics together. A utilitarian yet intimate practice, Kantha is traditionally sewn for loved ones as an intricate and personal keepsake. It is also a modest form of embroidery, usually used to reinforce fabrics that are wearing out or to make something new out of old pieces of cloth. The embroidery most commonly associated with India is called Shisha and it is from the western regions of Rajasthan and Gujarat. Shisha originated from Persia and is also called mirror-work. It involves using uncountable tiny, interlacing threads to sew hundreds of little mirrors onto the fabric. This embroidery is usually seen on items such as bedspreads and pillows. This deeply folkloric artform touches hearts because it translates a sense of beauty that is deeply human. It takes time and patience to create, and is simply transformative—both for the sewer and for the garment.